These rich, dark chocolate minis are perfect for both larger events and enjoying in your home. Vegan, soy- and gluten-free. *Organic Chocolate Liquor, *Organic Raw Cane Sugar, *Organic Cocoa Butter, *Organic Unrefined Whole Cane Sugar, *Organic Ground Vanilla. 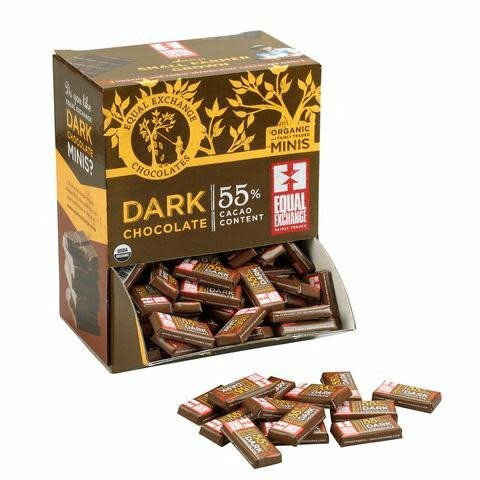 *Fair Trade ingredient: by weight 100% from Fair Trade cooperatives. May contain traces of milk, peanuts, hazelnuts, almonds, cashews, pistachios & pecans.